National Film Society's action/comedy webseries will be available on all major VOD platforms. Mark your calendars, film fans. Awesome Asian Bad Guys are coming to get you! The webseries-turned-feature action/comedy Awesome Asian Bad Guys, from Stephen Dypiangco and Patrick Epino, aka National Film Society, will be released by FilmBuff on June 23 on all major video-on-demand platforms including the film's website, powered by VHX, Amazon Instant Video, Google Play, iTunes, Vudu and Xbox Video. In Awesome Asian Bad Guys, a pair of down-on-their-luck filmmakers must assemble a ragtag group of Asian "bad guy" actors in a deadly mission to take down LA's most nefarious crime boss. The cast includes Randall Park (Fresh Off The Boat, The Interview), Al Leong (Die Hard, Lethal Weapon), Dante Basco (Hook), Tamlyn Tomita (The Karate Kid Part II, Joy Luck Club), George Cheung (Rambo: First Blood Part II) and Aaron Takahashi (The Wedding Ringer). Full disclosure: I served as executive producer on the project. The film is an irreverent homage to the nameless, expendable Asian villains of '80s and '90s action flicks. "These legendary performers have spent their careers in the background, and this project finally gives them their due," says Patrick. "It places them front and center where they belong." That's right! 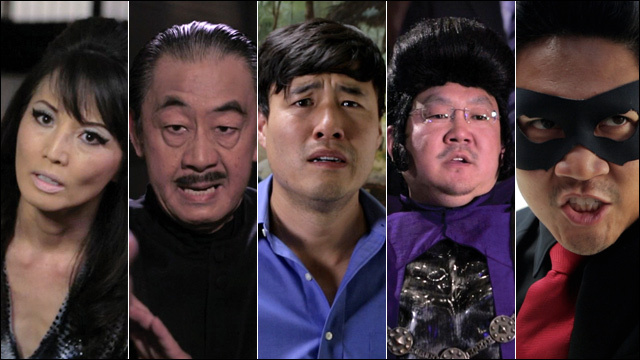 Awesome Asian Bad Guys all started over three years ago with an idea unceremoniously hatched in a two-minute video on Stephen and Patrick's National Film Society YouTube channel. The guys knew they were on to something, and wanted to do more. With a modest but engaged, passionate audience, Patrick and Stephen assembled a team of producers, cast and crew, and took the concept to Kickstarter, where they raised over $50,000 in production funds and expanded their fan base. The first web-based project to ever participate in the prestigious Independent Filmmaker Project Emerging Storyteller program, the film premiered at CAAMFest 2014 and went on a successful festival run, playing to sold-out screenings of enthusiastic fans. And now it's finally coming to you, internet, on June 23. If you pre-order the film, you can join in on the fun as part of the big Awesome Asian Bad Guys digital launch. Using VHX, the guys will coordinate an online watch party experience accessible from anywhere in the world on June 23, tied to a special live premiere event in Los Angeles. We're doing it big! "Awesome Asian Bad Guys owes its existence to our online supporters, so it only makes sense to thank them and reach new fans with a big online watch party," says Stephen. Indeed. Personally, it's been a blast to work with good friends and be a part of the project. I'm honored to have a small part in making it happen, and I can't wait to share Awesome Asian Bad Guys with everybody online. So mark your calendars for June 23! Awesome Asian Bad Guys is now available for pre-order in standard and deluxe digital versions from AwesomeAsianBadGuys.com.